CyberPower's 6AWGHW3FT power cord allows you to connect any hardwired UPS system or step-down transformer operating on 208V, up to 60A. 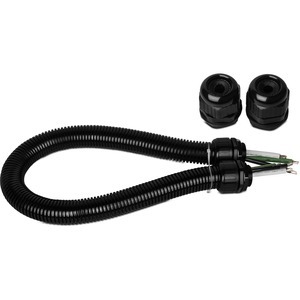 Power cord includes two (2) cable glands to provide a secure fit to terminal block covers, one (1) heavy duty conduit, and two (2) conduit fittings. Three (3) foot cord is 6/3 AWG conductor wire. This CyberPower power cord comes with a 1 Year Limited Warranty.